A casual summer classic, The Navy Stanfield Denim Casual Shirt is a versatile shirt that will pair seamlessly with just about everything in your closet. The Stanfield is a navy denim shirt with a white dot pattern. This lightweight and super soft shirt is constructed with 100% cotton denim fabric sourced from luxury Spanish mill, Sidogras. 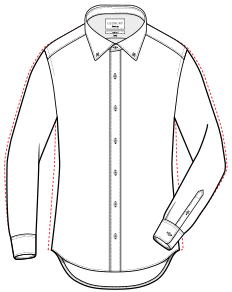 Finished with a button-down collar and a shortened body, allowing the shirt to be worn untucked. Features a left chest pocket. Available in classic and tailored fit. Fabric: 100% Cotton Denim, sourced from Spanish luxury mill, Sidogras. Fit: Available in classic and tailored.